In a shaker filled with ice, combine the juice from the lemon and lime wedges, the tomato juice, vodka, horseradish, Worcestershire sauce, tabasco, pepper, and celery salt. Shake to chill and strain into the collins glass. Garnish with the celery stalk. 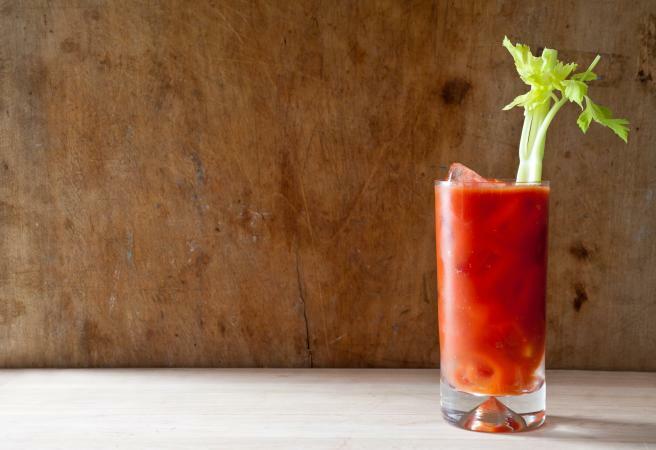 If you can't get enough of Mary, then try these other Bloody Mary recipes. Try this Bloody Mary punch to serve a crowd. A bacon Bloody Mary is the perfect breakfast cocktail. Try a spicy tequlia version, the Bloody Maria. If you want to add variety to your Bloody Mary, consider these fun add-ins. Add a dash or two of liquid smoke or a pinch of smoked paprika to give your drink a smokey flavor. Garnish with a smoked baby back rib on a skewer. Sweeten it up a bit with a tablespoon of brown sugar and garnish with an orange wedge. Make a Bloody Geisha by replacing the vodka with sake and garnish with two California rolls on a skewer. Replace the tomato juice with clamato juice for a briny version of the beverage and garnish with a cooked and peeled prawn and a lemon wedge on a skewer. Add a pinch of onion salt, a pinch of garlic salt, and a pinch of chili powder. Replace the vodka with grapefruit jalapeno vodka. Garnish with a sprig of cilantro and a jalapeno popper on a skewer. Add a pinch of cayenne and a tablespoon of pepperoncini brine to the drink and garnish it with a whole pepperoncini. Garnish a classic Bloody Mary in a glass rimmed with garlic salt with a sprig of basil. Bloody Mary is a popular cocktail, and it's not hard to figure out why. With so many flavor and garnish variations, you can create the perfect Bloody Mary for almost any theme.